For Wycombe-based five piece Young Guns, having your debut release produced by ex-SikTh duo Dan Weller and Justin Hill (previously produced Enter Shikari and Gallows) and following shows with Funeral For A Friend and We Are The Ocean. Expectations of the band's 'Mirrors' EP are pretty high. Thankfully it does with opening track 'Daughter of The Sea' with it's fierce guitars and drums which punch through at a steady pace. Evenetually the song leads to a strong chorus that swings and filled with a great guitar riff. 'Weight Of The World' is more of the same of the hard-hitting melodic metal-core with a chorus that wouldn't possibly seem out of place on a Alexisonfire record. Whilst 'There Will Be Rain' is heavy as it gets for Young Guns, with it's rapid pace and screeching guitars. However vocals that don't seem to have any affect untill the chorus, where the help of backing vocals helps the song come alive but the lyrics are something to be ignored, as the band's strong musicianship take lead. 'In The Night' closes the EP and continues the rapid, frantic speed that Young Guns go at. It's thumping beat roars through and much like the last track, the band's playing is tight and stand's out, as does Gustav Wood's strong lead vocals. The addition of gang vocals brings 'Mirrors' to a high climax. 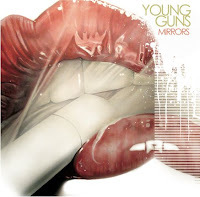 'Mirrors' is a strong debut from a band with plenty of potential, however it's definitely a grower, especially if you are not a big fan of the style of music Young Guns play. Nevertheless the blend of heavy riffs and strong melodies are a good combination and Young Guns could have a winning formula. Visit Young Guns Myspace for more details.